The West Indian bay leaf (pimenta racemosa) is much more fragrant and aromatic than its Turkish, Indonesian, Californian, or Indian cousins. Its flavor is intense and highly spiced, with complex notes of cinnamon, clove, and nutmeg along with hints of vanilla and cardamom. If you rub the leaves, the distinctive scent will remain on your fingers for hours. Known simply as "the spice tree" in some parts of the Caribbean, this large, towering tree is also known as "sweet bay" and the "bay rum tree." A species of plant in the myrtle family and related to allspice, it's found throughout the Caribbean. The tree needs plenty of sunshine and water to grow, so it's ideally suited to the climate. The leaves are available all year and are usually sold fresh simply because of their abundance, but they can also be dried and stored indefinitely. West Indian bay leaves vary in size. They can range from 2 to 5 inches in height and can be as wide as 2½ inches. The leaves are thick and shiny with a color ranging from bright green to bottle green. The darker the leaves, the more mature and robust the flavor. Bay leaves are used for cooking rice dishes, soups and stews in the Caribbean, just as they are in other parts of the world. They're most prized when cooked in porridge, such as with oats or plantains. Bay leaves are also used to make tea — you can brew a pot with just the bay leaf, with bay leaf and lemongrass, or with bay leaf and cocoa. Although bay leaves are prized in the West Indian kitchen, they're also used in other parts of the home as well, serving as air fresheners and an insect repellent. 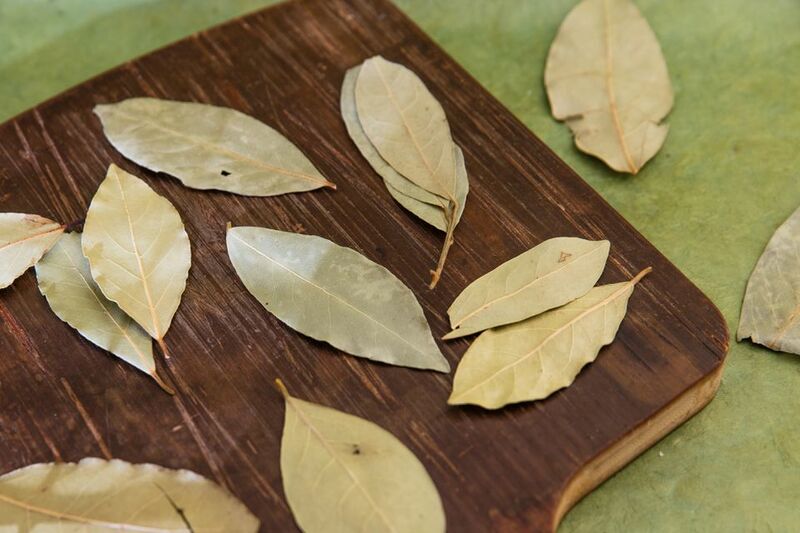 Fresh bay leaves may be strewn in pantries and cupboards to keep bugs away. Because they're always available, replenishing this natural air freshener and insect repellent is never a problem. The Caribbean has a rich heritage of folk medicine, and you can still find older folk recommending a hot cup of bay leaf tea to lower blood pressure. Bay leaves are also said to help with digestive problems and headaches. Additionally, it's said bay leaves can work against muscle aches and pains, and the oil in the leaves has been found to contain anti-bacterial properties. Bay rum has been used in old-fashioned colognes, particularly in the West Indies. The cologne was introduced in the earliest days of the 20th century. The oil was distilled from the leaves using rum and water, creating a spicy, almost smoky scent. Only the leaves of pimenta racemosa can be used in cooking and teas. All other parts of the plant, including the small black berries surrounded by a lacy network of white flowers, are not edible and should not be ingested. Despite the name, the "rum" isn't drinkable—it's toxic.